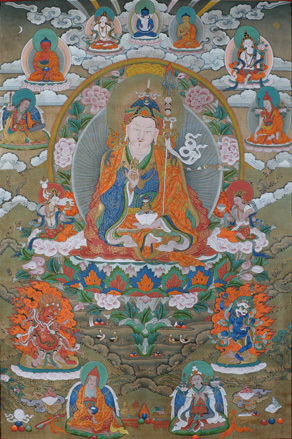 Guru Tsokye Dorje (Skt. Saroruhavajra; Tib. གུ་རུ་མཚོ་སྐྱེས་རྡོ་རྗེ་; Wyl. gu ru mtsho skyes rdo rje; Eng. 'Lake-born Vajra') — one of the Eight Manifestations of Guru Rinpoche. One of the distinctive features of this peaceful form of Guru Rinpoche is that he is represented holding a vajra at his heart. As Guru Rinpoche was born within the lotus flower upon the waters of the lake, the dakinis called out to him from their hearts, and their call spontaneously became the Vajra Guru mantra. So this mantra is his heart mantra, his life core, his heart essence, and to recite it is to invoke his very being. He is known as Tsokye Dorje, 'Lake-born Vajra'. This page was last edited on 28 June 2014, at 11:49.